Don't be afraid of the snake: Python might look intimidating if you haven't done much programming before, but it's friendly. If you're using a text-based programming language for the first time, Python is a great choice. Raspberry Pi Foundation co-founder Eben Upton has called Python his favorite language for learning and development, and it's a natural next step after Scratch. If you're an experienced programmer, you'll find that Python is powerful and helps you be productive. It's not just an educational language: Google hires Python programmers, and the language was used by Industrial Light and Magic in producing Star Wars: Attack of the Clones. With all those spaceships and light sabre fights, few people noticed the Python in the background. 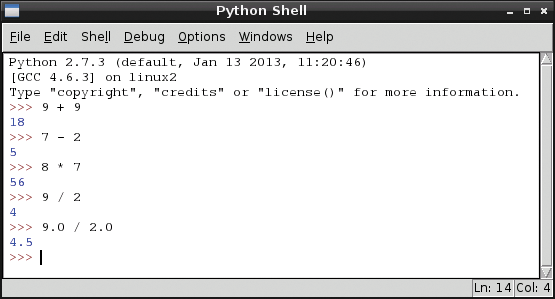 Two different versions of Python are in popular use today, and the Raspberry Pi supports both of them. Python 3 is the latest version of Python, and it's the one that's being actively updated. The only reason not to use it is that some software you might want to use doesn't yet support Python 3. In those circumstances, retreat to Python 2.7. Most of the time you won't have to worry about which version you're using, but programs for Python 2.7 won't always work in Python 3 and vice versa. 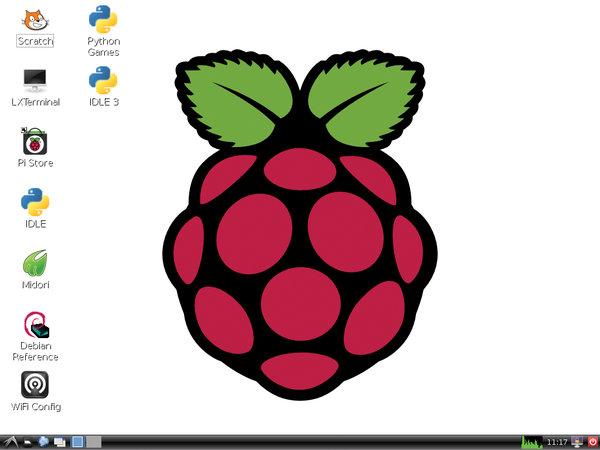 Python is an important language for the Raspberry Pi environment, and it comes pre-installed in many Raspberry Pi Linux distributions. If you can't find Python on your system, install it through your distro's package management system. If you are using the Raspbian Wheezy distribution, you've probably noticed the IDLE icons lounging around on your desktop (Figure 1). IDLE is an Integrated Development Environment (IDE) used for writing Python programs. An IDE is a user interface that formats the code and provides easy access to helpful developer tools. IDLE offers an easy way to create and run Python programs. Use IDLE for Python 2.7 and IDLE 3 for Python 3. To start, double-click the IDLE 3 icon. Figure 1: The IDLE and IDLE 3 icons are your gateways to Python programming. The print command has nothing to do with printers: It's used in Python to write text to the screen, so when you press Return, the computer will write a friendly Hello! before returning you to the prompt. You can change what goes between the quote marks to display any message you like. With commands like this, always make sure you have matching opening and closing brackets, and opening and closing quotes. Python is case sensitive, which means you can't use uppercase in place of lowercase or the other way around. If you try entering the command with a capital P, you'll get an error message, which is shown in red to hammer home the point (Figure 2). The words print and Print might look similar to us, but to Python, they're completely different. Figure 2: Python gets on your case if you use capitals by mistake. That doesn't work in Python 3 (IDLE 3), though, because Python 3 needs those parentheses. From this simple example, you can see that it might be fiddly to get a program from Python 2 to work in Python 3, depending on the program. I used to know a joke about a snake who borrowed money, and when he came to repay it, he hadn't worked out the amount plus interest correctly. It was because he was a poor adder. These sums are trivial (except perhaps 8 * 7: Many people get hazy around that part of the multiplication table), but they're good for testing. These operations work in the shell, because when you enter something that isn't a command (or something Python can do), it evaluates what you give it. That means it asks itself, What is plus whatever you entered, and it gives you the answer. You'll notice that I've used a space on either side of the math symbols here. I could have used several spaces or none at all, and it would work equally well. The difference, though, would be readability. One reason Python is a great language is that it's designed to be easy to read. The language has strict rules about how you indent some lines to make your programs easy to skim, as you'll see shortly. However, a strong community around Python also evangelizes readability and has its own conventions as to what constitutes true "Pythonic" code. One of the guidelines is that you use one space on each side of a math symbol. You don't need to get hung up on the differences between the versions of Python, but if you can't get an example you've found online to work, it might well be because of oddities like this. Figure 3: Strangely, in Python 2, 9 divided by 2 equals 4.